Sleep State Interrupt was a 2017 nominee for a major sci-fi award: the Compton Crook Award for Best First Science Fiction Novel. 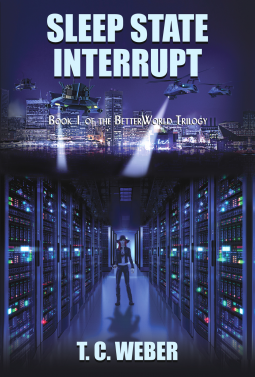 "The Wrath of Leviathan," Book 2 of the BetterWorld Trilogy, of which "Sleep State Interrupt" is Book 1, will be published in September 2018 and will be available via NetGalley. "A thoroughly exciting read." --John DeDakis, former White House correspondent and author of Fast Track, Bluff, and Troubled Water." "Sleep State Interrupt is a gritty, darkly humorous techno-thriller with flawed, believable characters, a taut, compelling plot, and a lot to say about the present-day USA." --Zeke Teflon, author of Free Radicals: A Novel of Utopia and Dystopia.